Advertising influences brand purchase through short-term effects determined by direct increases in penetration, basket size, and buy rate. Advertising also influences brand purchase through long-term effects determined by indirect increases of future purchases through trial and increases in loyalty and brand equity. The current study measured the long-term effect of television advertising by tracking households' purchases that were exposed to advertising out for a year after the initial short-term period. By measuring the increases in these “future purchases,” this method captured the influence of advertising on long-term brand purchases. It also reported the multiplier required to translate the short-term measured effect into the total long-term and short-term effects of advertising. The general rule of thumb for calculating the total influence of television advertising is to multiply the short-term effect by two. Though an average effect may be helpful for a general understanding of how advertising works, measuring and monitoring the actual long-term multiplier is critical to developing further insights. The size of the long-term effect has a direct effect on the return an advertiser can achieve through advertising and the balance in value between all marketing vehicles. Learning how to increase the long-term effect, therefore, will have a direct impact on how well an advertising campaign will perform now and in the future. Scholars for decades have grappled with measuring advertising effectiveness. In the 1970s and early 1980s, they focused on lag effects, decay rates, adstock, lag coefficients, and half-lives (Spaeth and Sylvester, 2014). In the 1990s, game-changing work demonstrated that the long term is roughly equal the short term and that advertising should be valued at twice the short term (the “two-times” multiplier; Lodish, Abraham, et al., 1991; Lodish, Abraham, et al., 1995). A time-series regression model also estimated these effects (Mela, Gupta, and Lehman, 1997), which is now used widely among marketing mix modelers. The potential of single-source data was identified, and the concept of repeat purchases and loyalty influences was developed (von Gonten and Donius, 1997; Ambach and Hess, 2000). In addition, the value of price elasticity was explored as it related to long-term effects (Ataman, Van Heerde, and Mela, 2010). The current study leveraged single-source data to measure the exposure of television advertisements to households and their purchases across time. Using that single-source data, the researchers measured the increases in future brand spending as households were moved to trial (hereafter referred to as “Trial”) and as advertising moved households to higher levels of repeat purchasing (“Depth of Repeat”). Consumers today have many more options for researching, understanding, and selecting brands, thanks to unlimited digital access to information and a plethora of choices. These choices surely must challenge a brand's ability to maintain and build brand loyalty. Having the ability to track and measure the impact of advertising on long-term purchases provides insights into how large these changes are and among which customers they are taking place. Advertising builds sales in the short term by increasing penetration, basket-size, and buy-rate. Penetration is increased through attracting new customers and getting Trial. Basket-size is increased through having existing consumers buy more each time they buy, and buy-rate is increased by having consumers purchase more often. Buy-rate is the increase in the number of purchase occasions. Advertising, however, is designed to build stronger emotional and behavioral connections to consumers over time. Through these connections, advertising builds brand equity and brand value. One way to quantify equity and brand value is through loyalty. Most advertising models show that the largest contributor to what a consumer buys is based on what he or she bought the last time (Aaker, 1995). Thus, loyalty is the largest driver of brand choice—both in the current campaign period and across future brand purchases. The key to measuring the long-term effects of advertising is to identify a measure of loyalty that discriminates among consumers based on their future dollars purchases so that they can be segmented. Then, it is possible to measure how advertising changes the size of those segments. The current study identified the key discriminating factor as “Trial and Depth of Repeat.” Depth of Repeat is a measure of a household's brand loyalty. This method identifies the incremental value in long-term dollar sales of moving a household into Trial or to a higher level of Depth of Repeat. The incremental value is reported as a multiplier that can be applied to the short-term sales lift measures. The current method was built in two stages. Phase 1 was a collaboration of efforts of David Poltrack at CBS and Jeff Doud at Kellogg's—for the ARF Audience Measurement 9.0 (AM9) conference. (Poltrack, Doud, et al., 2014)—and the Marketing and Accountability Standards Board (MASB) on four brands from their members (Wood and Faehnle, 2015). The major contribution made in that work was the identification of Trial and Depth of Repeat as the discriminating variable to long-term incremental buying. Bill Harvey, executive chairman, Bill Harvey Consulting, Inc.
Dominique M. Hanssens, Bud Knapp Distinguished Professor of Marketing at the UCLA Anderson Graduate School of Management. Validation (See “Validation,” pp. 127-128). Phase 1 was not counting and then removing non-buyers of the brand in the “measured” week. This was remedied in Phase 2 and had a marked effect of lowering the average long-term effect. Only advertised periods should be evaluated. Only weeks during campaign and analysis period were included in Phase 2. Select long- and short-term periods carefully. In Phase 2, the short-term period was 12 weeks, the long-term period was one year, as that was commonly the longest complete data Nielsen Catalina Solutions (NCS) reports after a preperiod is used to determine Trial and Depth of Repeat. Only indirect effects were being accounted for. The short-term analysis period in Phase 2 was extended to 12 weeks to include all measureable short-term effects. Needs to be non-black box, so the fewer assumptions (like six-plus, or 28 days), the better. The short-term period in Phase 2 was extended to 12 weeks, and the 6+ Depth of Repeat was extended to be as high as could be reported for the short-term effects. Measure other media. The measurement of other media was made available to all customers. Be more explicit in how representative the sample is and how statistics are used. These were included in all Phase 2 analyses, which studied 31 advertising campaigns and 23 brands (See “Data,” page 128). One of the key elements of the long-term effect measure is Trial and Depth of Repeat. In the current study, all purchases were identified by their (household) behavior in the per-period (commonly one year but could be defined longer or shorter depending on brand specifics and data availability). If a household had not purchased the brand within one year prior to the purchase, that household was identified as “Never Bought.” When that household purchased the brand for the first time, the purchase was labeled as “T” for Trial. Among current brand consumers (those households not classified as “Never Bought”), the number of consecutive category purchases where the brand was bought were counted. This could be thought of as counting the length of the brand's “winning streak.” Trial and Depth of Repeat was selected as the measure to use for long-term effects among a long list of possible measures of a household's loyalty to a brand. Trial and Depth of Repeat exhibited the highest discrimination of average dollars spent per future week; the higher the Trial and Depth of Repeat, the higher the future brand sales (See Figure 1). The researchers selected household purchases that were influenced by advertising and ran the average dollars spent on the brand by each household across the entire one-year post-period, starting after the influenced purchase. Actual sales in the 52-week post-campaign period among households that had “Never Bought” in the prior year or the influenced week were $9.19. The post-period dollars for households that made a “Trial” purchase in the week influenced by advertising was $13.72, compared to $16.75 for “Zero-Switchers.” A “Zero” Trial and Depth of Repeat is a purchase in which the consumer did not buy the brand the previous time but did buy it during the influenced purchase, and is thus labeled a “Switcher”. These average dollars per household were very low compared to the higher Trial and Depth of Repeat ranges of 20+ with $575 average dollars per household (See Figure 1). Trial and Depth of Repeat 3: trial purchases continued to drop dramatically to $25,530, and declined further thereafter. Prior to the current study, there was quite a bit of evidence that Trial was critical. The Ehrenberg-Bass Institute strongly promoted the theory that building the number of new buyers is the key way to build a brand (Sharp, 2010). The current data, however, would disagree: Trial is important, but it does not represent the most important group of buyers, and it does not have very high long-term value (See Figure 2). The current study found that, yes, Trial is a measure of behavior among previous non-brand buyers. To produce long-term sales, however, a brand must focus on current brand buyers. In other words, a brand must put the consumer in the center and make the customer king. The current study's method for measuring the increase in loyalty was based on the increase in dollars per household out in time. As the current study has demonstrated (See Figure 1), moving a consumer up the ladder of purchase will produce higher post-period sales within that household. If that illustration is transformed into the value of moving up the ladder of purchase, the values average roughly $15 higher at each higher depth of repeat (See Figure 3). The current researchers measured the value of moving consumers to higher loyalty through the Trial and Depth of Repeat measure. Then, they weighted the value of each of those increases on the basis of degree to which the advertising had a short-term effect of increasing the number of purchases at each of these levels. Classify each category purchase based on its Trial and Depth of Repeat. The short-term effect of advertising on these classifications was measured using standard NCS Sales Effect Media Impact measurement. 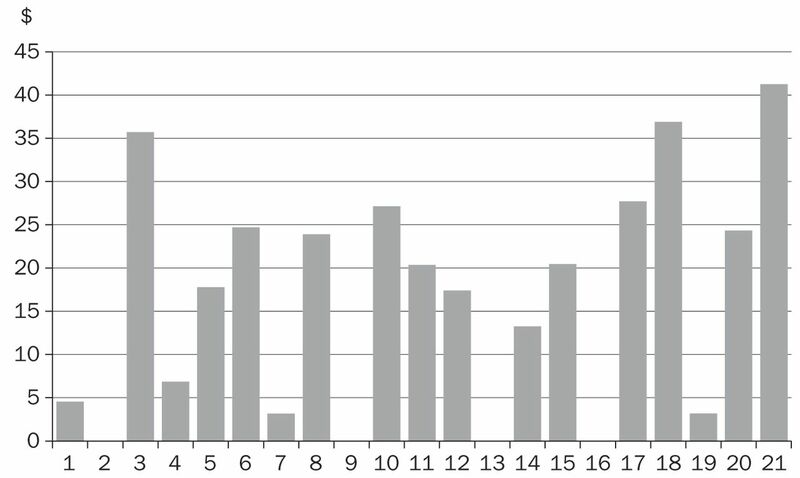 This technique identified the purchase occasions that were influenced by advertising exposed within 12 weeks prior to purchase. 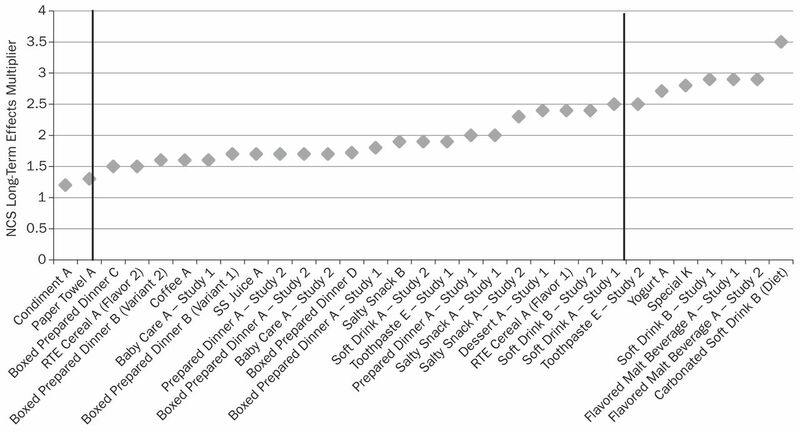 The post-period brand dollars spent among exposed households (in the measured campaign) were summed within each Trial and Depth of Repeat classification for the following year (See Figure 1). Divide the total long-term dollars per household by the number of incremental purchases made by those households in the short-term period. These were the multipliers for each level. What was needed was the value of moving up to higher Trial and Depth of Repeat. This was accomplished in the next step. Subtract the average dollars/household of the lower-level Trial and Depth of Repeat to its next highest Trial and Depth of Repeat. This produced an estimate of the long-term multiplier for each incrementally higher Trial and Depth of Repeat. Combine those values for the existing campaign by weight averaging these individual multipliers based on the short-term incremental sales generated by the advertising campaign. This produced the estimate of the long-term multiplier. Increment the multiplier by one to estimate the total long-term and short-term effect of advertising. The measurement period for the short term was 12 weeks—the longest period that direct advertising effects generally are found in single-source data. The measurement period for the long term was one year post-direct advertising influence. The constraint on the long term was the length of time that NCS stores data—2.25 years. Once the first year was used to determine whether the household is or is not a trier, only one year was left to measure the long term. The key method used for validation was to match as closely as possible the original “How Advertising Works” paper (Lodish, Abraham, et al., 1991). That research was based on BehaviorScan–matched household tests2 in which households were matched on the basis of past purchasing, demographics, and stores shopped during the base year. Those results were analyzed using an analysis of covariance (ANCOVA) methodology with covariates “to account for any uncontrolled factors—such as price, competitive promotions, etc. which might have been different among the different subgroups in the stores in which they shop from week to week. The scanner panel data are aggregated to the store-week level for both the treatment and control groups”(Lodish, Abraham, et al., 1995). 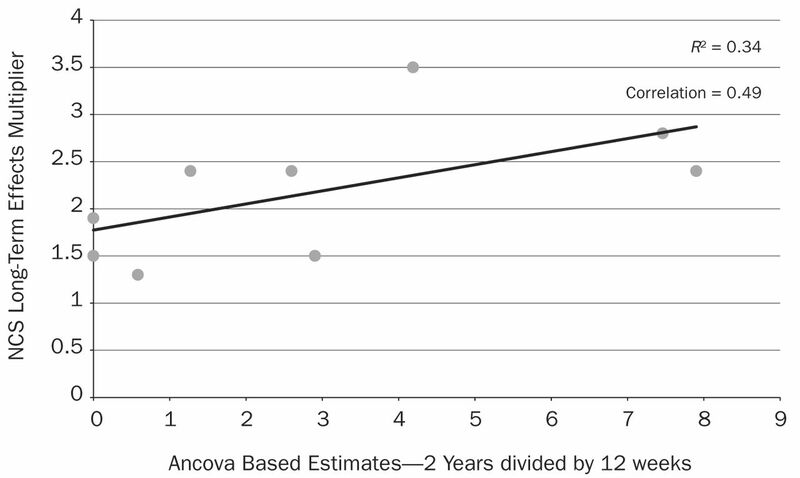 In the current research, NCS analyzed all television ANCOVA studies performed in the prior two years. These studies were limited to shorter or smaller campaigns because ANCOVA required reach of less than 75 percent. This limitation was imposed to ensure that control households could be found with similar characteristics to test households. Again, NCS maintains 2.25 years of past data, so these were the studies with current data available. There were 15 studies available. Of those 15 studies, nine had more than one full year of post-campaign data available and, thus, enough to estimate the same values reported in the 1995 paper (Lodish, Abraham, et al., 1995). 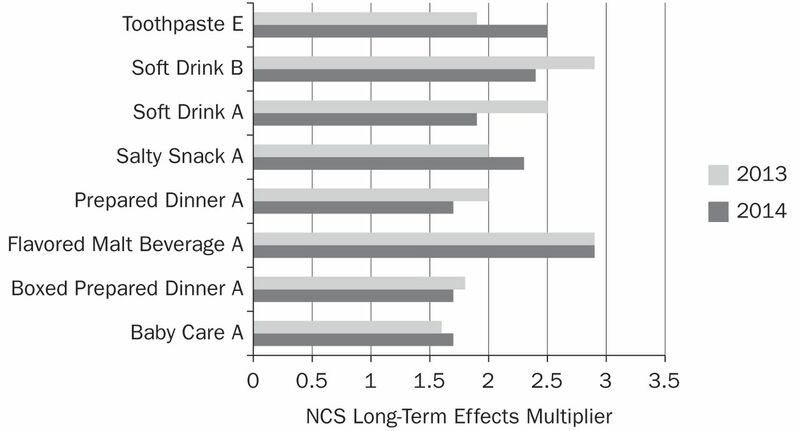 Among the nine studies, the range of long-term effects from −1 to 9.7 was very similar to the original range of long-term effects values across the original 55 studies examined (See Figure 4): The 1991 study had shown long-term effects multipliers ranged from −2 to 9 (Lodish, Abraham, et al., 1995). And, both the current and 1991 studies showed a predominance of campaigns with roughly a “2” multiplier. The original study used a one-year measure of short-term effects. In current practice, advertising's short-term effect generally is measured for 12 weeks. Marketing-mix models use decay and adstock to estimate direct effects. Single-source methods generally use four to eight weeks to measure short-term effects, recognizing that between 90 percent and 100 percent of the direct effects happen within this time period. Therefore, these same nine studies were reexamined with a 12-week short-term effect. Those estimates were compared to the estimates from the current research. The R2 of 0.34 and correlation of 0.49 demonstrated that there is a general similarity between the 1991-matched household method and the current research (See Figure 5). NCS's single-source television panel was used for the Phase 2 analysis. It was built using the firm's 70 million-household Frequent Shopper Panel, which includes the purchases made by roughly half the households in the country at 12 of the top 14 supermarket retailers plus Rite Aid. To be included in the current study, a household had to have made purchases totaling at least $50 in 10 of the last 12 months. The study also was built on the NCS national television panel, which included the exposure to advertising in the Nielsen Peoplemeter Panel and the Nielsen Metered Market Panel and 4.3 million set-top-box homes. To be included, these households had to have reported good set data (does not require viewing, only ability of the tuner to report viewing if it were to happen) at least half of the time. After both statics were applied across the 2.25 years of data, the sample included 210,000 households with good viewing and purchasing data. Starting with such a large sample allowed the researchers to apply a very strict static/in-tab across such a long period of time and still have a very reasonable sample of households to work with. The average long-term effect across all of the Phase 2 analyses conducted thus far—31 campaigns and 23 brands—was 2.04. The range of results was from 1.2 up to 3.5. The lowest brand results were for a condiment with the longest purchase cycle of all measured brands, an average of $641K category dollars per week in the NCS panel and a low short-term effect. The highest brand results were for a soda with a fairly short purchase cycle, an average of $30K category dollars per week (the highest category) and a high short-term effect (See Figure 6). The long-term effect was measured year-over-year for eight brands (See Figure 7). In general, year-over-year multipliers were similar; however, the change from one campaign year to the next could be as high as 32 percent. This indicated that the long-term effects multiplier was related to the current marketing campaign and the basic brand characteristics. The 31 campaign studies were examined to identify the possible influences on long-term effects. The following observations identified variables that seemed to have an influence on the size of the multiplier, and those that did not. Weekly dollar volume: Brands in categories with high weekly dollar volume have higher long-term effects. This may be due to the fact that these brands tend to have both shorter purchase cycles and higher purchases per week. 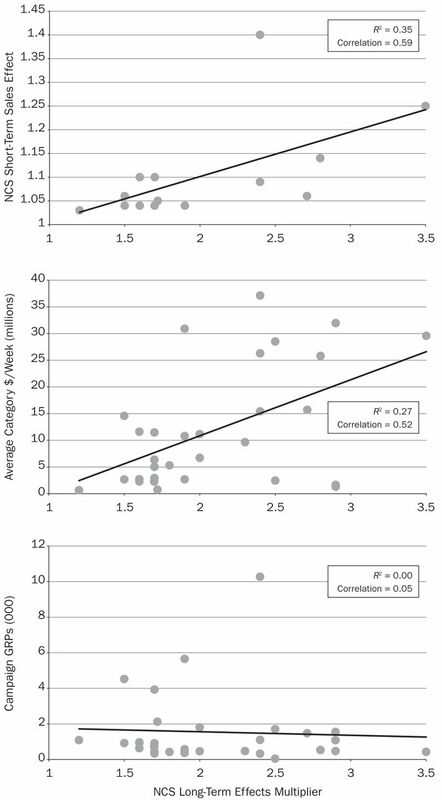 The authors of the current study conjectured that these lead to higher reinforcement of the message and a longer and stronger possible loyalty connection with the consumer—an R2 of 0.27 and a correlation of 0.52 (See Figure 8). Purchase cycle: One element of weekly dollar volume is purchase cycle. Purchase cycle appears to be responsible for roughly half of the weekly dollar volume influence. Purchase cycle is a key influence because the shorter the purchase cycle, the more regularly the brand can be purchased, and the higher the value of loyalty. The correlation between purchase cycle and long-term effects is −0.38, and the R2 is 0.14. Percentage of Trial: A common belief is that Trial drives long-term value. This is true for some brands but, overall, increasing loyalty and repeat buying among current brand buyers has a higher influence on long-term effects than Trial does. 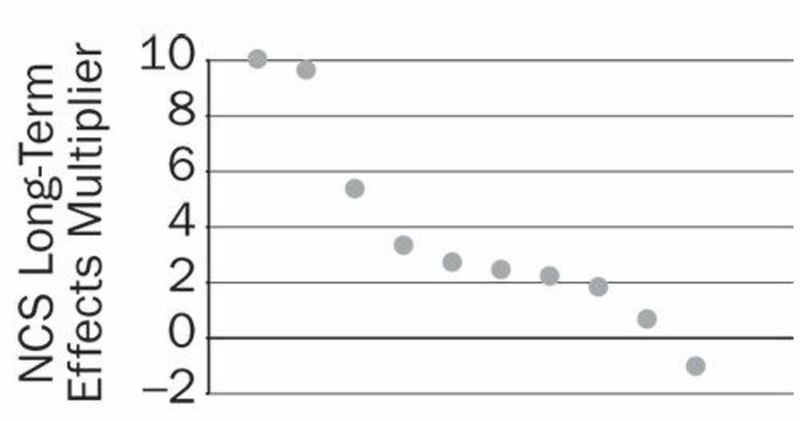 In the current research, the R2 measured was a low 0.10, and the correlation (−0.32) was driven by the lowest outlier—so the point was not that there is a high negative correlation, but that the researchers did not see a strong positive relationship. Gross rating points (GRPs): With an R2 of zero, there did not appear to be any relationship between the size of the advertising campaign and the long-term effects. This meant that the influence of more GRPs was on the campaign's reach and frequency, which drove short-term effects but did not influence the long-term multiplier. How does the long-term multiplier change for advertising in other media than television? What are the effects out further than one year? What marketing elements drive higher long-term effects or, said another way, how can an advertiser increase its brand's long-term effect? Are the long-term effects different for brands outside CPG? Leslie A. Wood is chief research officer at Nielsen Catalina Solutions. Wood is responsible for all research including shaping the methodologies and playing a key role in envisioning future products. She has a long history with deep involvement in single-source methodologies including BehaviorScan, Scan America, and Project Apollo. Wood is the chair of the Advertising Research Council and president elect of the Market Research Council. A recipient of an Advertising Research Foundation Great Mind Award, she has many articles published in professional journals. David F. Poltrack is chief research officer, CBS Corp., and president of CBS VISION. Poltrack oversees all research operations at CBS encompassing audience measurement, market research, program testing, advertising research, and monitoring of the national and international video marketplace. Among his other roles, Poltrack is chairman of the board for the Advertising Research Foundation (ARF) and, as adjunct professor, teaches at NYU Stern School of Business and the Steinhardt School of Education and at Columbia University. He is the author of Television Marketing: Network, Local, and Cable (McGraw-Hill, 1983) and has many articles published in professional journals. ↵1 A purchase occasion is an actual shopping day. Within a purchase occasion, one can measure the number of purchases, the dollars spent, the brands selected—or even whether the household was exposed within 12 weeks prior to that purchase occasion. ↵2 BehaviorScan is a patented in-market testing service that quantifies the ROI of a new television advertising program, developed by IRI (Information Resources, Inc.). At a June 2014 Advertising Research Conference, Nielsen Catalina Solutions (NCS) and CBS presented a joint study that suggested the long-term effects of television advertising could be stronger than originally believed. Their work essentially updated the rule of thumb engrained in marketing analytics for a quarter century—that the long-term sales lift from advertising is, on average, double what occurred in the early weeks. The so-called “two-times” multiplier is used broadly to justify advertising spending; marketers doubled the short-term effects of advertisements found in their marketing-mix models to estimate the long-term effects. The 2014 study, which tested advertisements for Kellogg's Special K and four other brands, not only found that the long-term effect (defined as more than a month) still existed but showed total sales lifts ranging from 1.8 to 4.5 times initial lift, for a stronger average of 2.98. Responding to industry calls for even deeper analysis and improved methodology, the NCS-CBS team this year have expanded their work, testing “single-source” household data across 23 consumer packaged good (CPG) brands and 31 television advertising campaigns. Households were characterized by their prior purchase behavior as either “brand triers” or by their “depth-of-repeat” purchases over one year. The result was an even more precise calculation of the long-term effects of advertising—but this time the numbers were only slightly better than the “two-times” multiplier. In this article, Leslie A. Wood of NCS and David F. Poltrack of CBS Corp. describe their fine-tuning of methodology over the course of their two-part study. They acknowledge many key research questions remain in this much-needed work in progress. And, even more important than a single multiplier is the continued measuring and monitoring of that number for developing further insights. Building Strong Brands. New York, NY: Simon & Schuster Inc., 1995. “Measuring Long-Term Effects in Marketing.” Marketing Research Summer, 2000: 22–27. “The Long-Term Effect of Marketing Strategy on Brand Sales.” Journal of Marketing Research 47, 5 (2010): 866–882.
. “How Advertising Works.” Information Resources, Inc., 1991.
. “How TV Advertising Works: A Meta-Analysis of 389 Real World Split Cable T.V. Advertising Experiments.” Journal of Marketing Research 32, 2 (1995): 125–139. “The Long-Term Impact of Promotion and Advertising on Consumer Brand Choice.” Journal of Marketing Research 34, 2 (1997): 248–261. “At Last, Long Term Ad Effectiveness Measurement, the Single Source Solution.” Presented at Audience Measurement 9.0 2014, New York, NY: Advertising Research Foundation conference. How Brands Grow: What Marketers Don't Know. Melbourne: Oxford University Press, 2010. “Advertising Exposure and Advertising Effects: New Panel-based Findings.” Journal of Advertising Research 37, 4 (1997): 51–60. “Measuring the Return for CPG with CLV—Project Review and Status.” Presented at Marketing and Accountability Standards Board Winter Conference (2014), San Antonio, TX, Marketing Accountability Foundation.